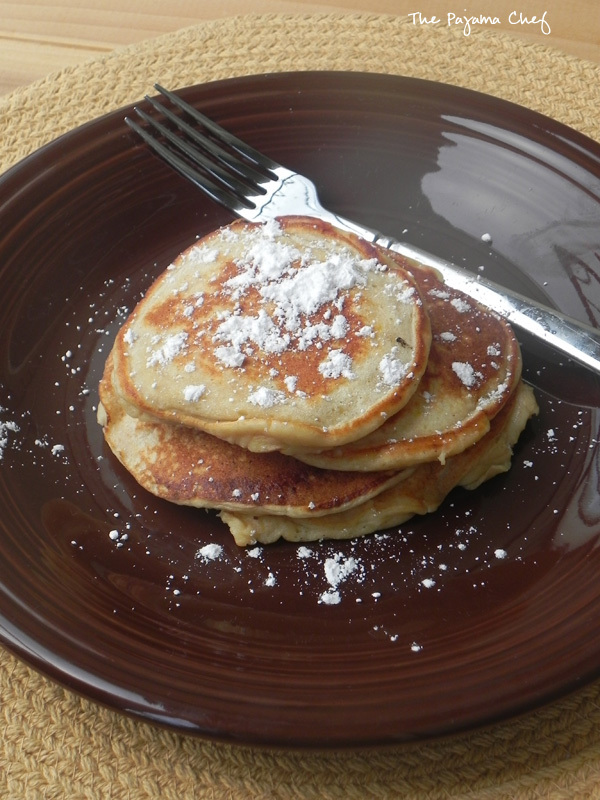 Flavorful fall pancakes–made with apple cider and topped with cinnamon sugar, these pancakes are a real treat! I don’t know how I first met Erin through blogging, but I’ve been fortunate to be part of a variety of blogging events with her over the years [like our weekly Menu Plan posts]. She always makes such creative dishes, especially for her #PBChocSat where she celebrates all things peanut butter chocolate to support her Buckeyes. 🙂 I obviously had a tough time to choosing what to make from her blog. Some close runner ups to these AMAZING apple cider pancakes included: Penne with Butternut Squash, Kale, and Goat Cheese, Apple Maple Turkey Burgers, Speculoos & Pumpkin Spice Oreo Lasagna, and S’mores Pumpkin Pie. There were a bunch of other runner up recipes too, but I couldn’t link to 20 of her recipes in one post. That would just be crazytown. These Apple Cider Pancakes are full of REAL apple cider flavor. Be sure to use good apple cider so all the warm fall spices and apple-y goodness comes through. 🙂 Erin topped her pancakes with a fabulous cinnamon sugar topping, a la an apple cider doughnut from an apple orchard… Let me just say–DON’T SKIP THIS PART. The cinnamon sugar topping takes these pancakes to the next level. They are unbelievable; a real treat without being a big sugar bomb. I know you’ll love them! Enjoy! Thanks, Erin for a great recipe! In a large bowl, stir together both types of flour, baking powder, and baking soda. In a medium bowl, whisk together eggs, olive oil, buttermilk, yogurt, honey, and apple cider. Pour wet ingredients into dry ingredients, then stir until combined. Mixture will be lumpy. Let batter rest for 10 minutes. When skillet is hot, add 1 tablespoon of canola oil to pan. Pour batter onto hot skillet in 1/4 cup increments. Cook for two to three minutes on the first side until bubbles form, then flip and cook on other side until golden brown. Add extra oil as needed so pancakes don’t stick, and don’t be afraid to adjust heat as needed if pancakes start to get too dark over time. Meanwhile, mix sugar and cinnamon together in a small bowl. After pancakes are removed from pan, melt butter on top of each pancake, then top with a sprinkle of cinnamon sugar. Serve immediately and enjoy! Notes: If your pancakes are, for lack of a better word, greasy enough already – no need to top with extra butter before adding cinnamon sugar. I found I only needed the butter on about half of the pancakes to make the cinnamon sugar stick. Check out other fall dishes at the link below! This sweet, eggy puffed pancake is stuffed full of yummy blackberries and topped off with a sweet cinnamon-maple syrup. It is the best breakfast treat! Can you believe I’ve never made [or tasted!] a puffed pancake before? Or a Dutch Baby or a German pancake or whatever you call this delicious egg-baked pancake treat. I did a little internet sleuthing on a puffed pancake’s origin, and basically like all recipes… there’s disputes. Surprise, surprise. Some say Seattle, but others say they’re similar to traditional baked “pancakes” served in Germany and other parts of the world or similar to a popover. No matter the origins, this breakfast is wonderful! And it’s made even more wonderful by the fact that I made this for the Secret Recipe Club! This month for Secret Recipe Club, I had the pleasure of being assigned to Amy’s blog, Savory Moments. I don’t know when I first started reading Amy’s blog, but it’s been awhile so it was so fun to peruse her archives and choose a recipe to make for y’all today! Amy is such a creative cook, let me say. She lives with her husband and pets [including a cute kitty!] in New York state and her recipes run the gamut from healthy dinners to indulgent desserts to classic food skills that have been lost along the way like preserving, fermenting, and canning. I don’t think it’s an understatement to say that every recipe I’ve seen on her blog looks like a treat and I had a hard time just picking one recipe to make and share today. In the past I’ve made a few of her recipes, most recently this Bacon Cheeseburger Pie. This time though, since Amy’s blog is so unique, I wanted to try something I had never made before. Some options I considered included stovetop kettle corn, watermelon-cucumber-mint aqua fresca [obviously with another fruit since it’s not quite watermelon season! ], rustic potato bread, Thai-style omelets, or even maybe ricotta cheese. 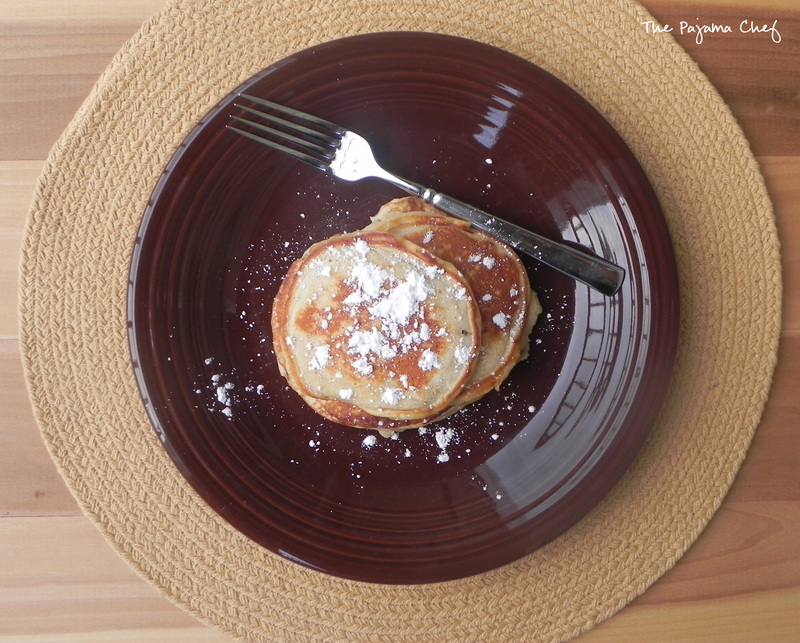 But then it was breakfast time, and I was hungry and spied a puffed pancake on her blog! Decision. Made! Preheat oven to 450 degrees F. Place a 10-12 inch oven proof skillet in the oven to warm. In a medium bowl, whisk eggs, milk, and vanilla. Fold in flour and salt. Place blackberries in a small bowl. Sprinkle with sugar, nutmeg, and cinnamon and toss gently together to mix. Carefully remove skillet from oven when preheated. Add butter to bottom of skillet, swirling to coat. When melted, place blackberries in bottom of skillet, leaving excess cinnamon-sugar mixture in bowl. Pour egg mixture over top, then return pan to oven. Bake for about 17-20 minutes, or until pancake is puffy and golden, pulling slightly away from the side of the pan. While pancake is baking, combine pure maple syrup with leftover cinnamon-sugar in a small saucepan. Heat on low until warm, stirring occasionally. Serve pancake in wedges topped with syrup, powdered sugar, or extra berries, as desired. Hope you can check out some of the other SRC submissions at the linky below! Delicate, melt-in-your mouth pancakes are made fluffy and delicious with ricotta, orange, and cinnamon. These fancy pancakes shouldn’t be missed! There’s pancakes and there is pancakes. These pancakes are pancakes, if you know what I mean. They’re light and fluffy, but also doughy and satisfying at the same time. 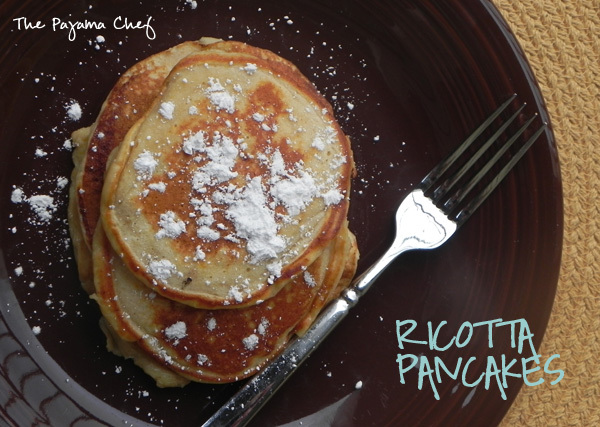 The secret ingredient that makes ’em that way is in the title–ricotta! In a large bowl, combine flour, baking powder, orange zest, cinnamon, and salt. In a smaller bowl, whisk together milk, ricotta, egg, orange juice, butter, maple syrup, and vanilla. Make a well in the dry ingredients and pour in wet ingredients. Gently stir until just combined. When skillet is hot, grease with oil or butter. Spoon batter in 1/4 cup increments on skillet, spreading if necessary. Cook for 1-2 minutes per side, until golden brown. Serve with additional maple syrup or powdered sugar. In my house, we love pancakes. Well, let me rephrase that. I love pancakes. My husband tolerates them [and sometimes is in the mood for them]. The cat just tries to steal them. That’s how it goes.I realized today that while I have six different pancake recipes on my blog [update! now it’s 10 wow! ], I haven’t yet posted my go-to pancake recipe. This go-to pancake recipe was a conglomeration of several different recipes from the internet and cookbooks that I started making back in the summer of 2009 when Ben and I were first married. I wrote it down in my recipe journal next to the likes of other household classics like my crockpot chunky applesauce. It’s the perfect tried and true pancake for any variety of mix-ins, and is great solo to allow toppings to shine. Sometimes to fancy it up, I’ll add a little vanilla extract or cinnamon to the mix, but it’s not necessary at all. These pancakes are a hit any way they’re served because they bake up thin with nice crispy edges–everything a pancake should do, in my opinion. I hope you like them as much as we do! In a medium size bowl, mix together flour, baking powder, salt, and sugar. Make a well in the center. Measure out milk in a measuring cup and then add egg. Beat gently with a fork. Add [cooled] butter and stir again. Pour liquid ingredients into well of dry ingredients, then stir gently to combine. Don’t worry if batter is lumpy. Pour batter onto hot skillet in 1/4 cup increments, topping with mix-ins as desired. Cook for a couple minutes on the first side until bubbles form, then flip and cook on other side until golden brown. Keep warm on a dinner plate covered with an aluminum foil tent until all are prepared, then serve with butter and syrup. Notes: My “syrup” in the photo is actually leftover raspberry sauce from my Lime Yogurt Cake. It is not 100% necessary to let milk and egg come to room temperature, but it yields better results. Recipe can be easily doubled with good results!